Few days ago we got some Pomleos from our friends’ farm. It is the coldest time of the year with temperature dropping to lowest and the fog looming most of the time. No one wanted to eat the humble citruses that were lying in the counter pretty ignored. 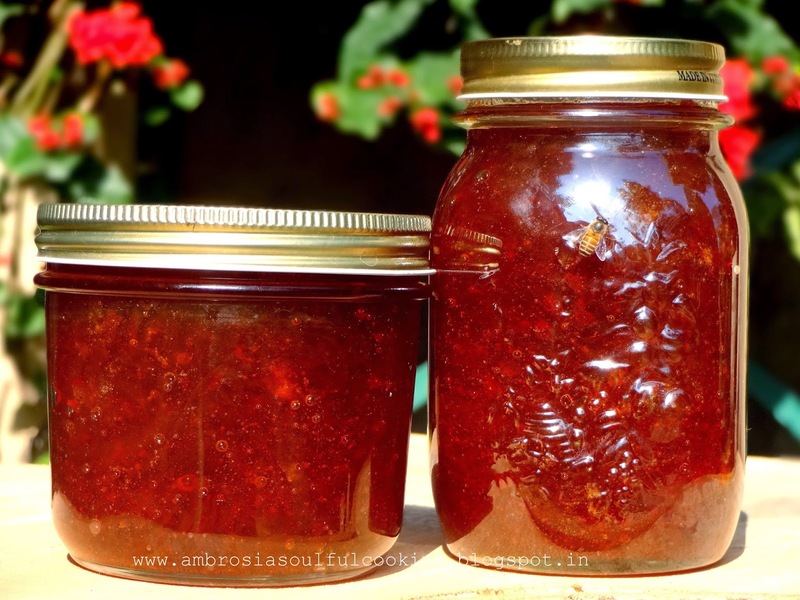 We love making jams, and, marmalade is our favourite. But I have never made orange marmalade solely because the pesticides and sprays that are used unscrupulously in oranges is intimidating, especially in marmalade where the peels are used. I have made Malta marmalade with Malta from the hills. Pomelos had to be used and using them for marmalade was the best way of doing justice to the fruit given to us lovingly and also the fact that they had not been sprayed with any pesticide. A Pomelo is a citrus fruit native to several countries in Southeastern Asia. It is also known as Chinese Grapefruit. 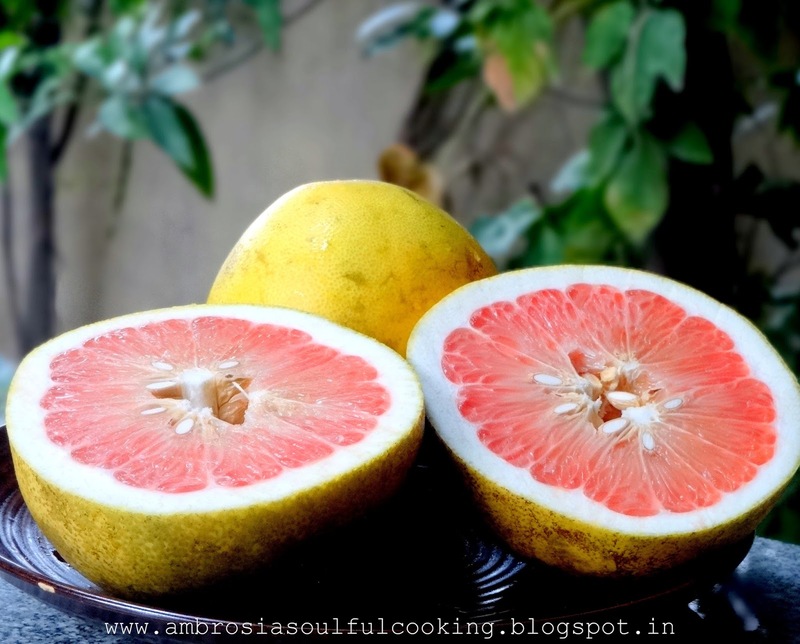 In Hindi, Pomelo is called Chakotra. Pomelo is the largest fruit in the citrus family. The peels of ripe Pomelo are pale green or yellow in colour and very bitter. The inner fruit is usually white, pink or even red. It is mildly sweet. 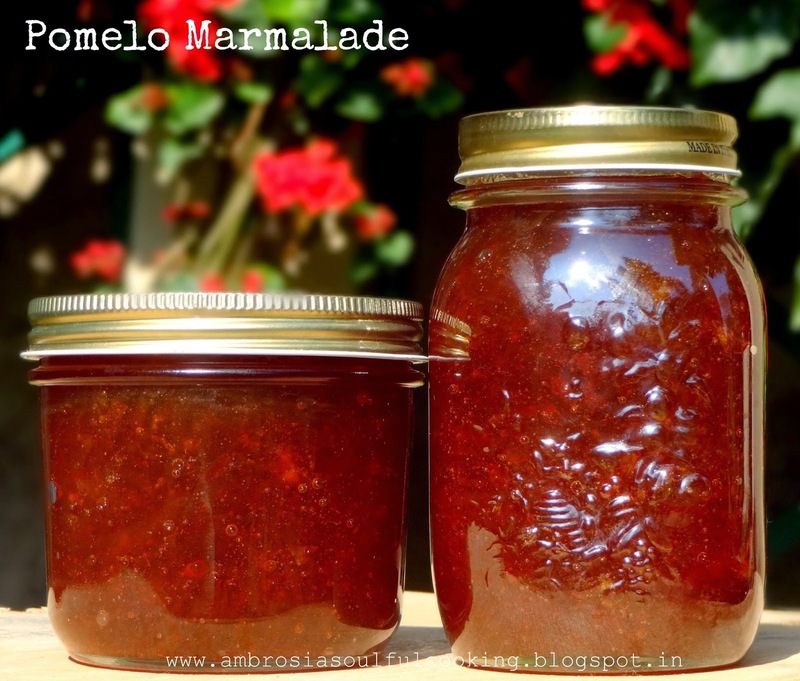 I followed my dad’s recipe in making Pomelo Marmalade. 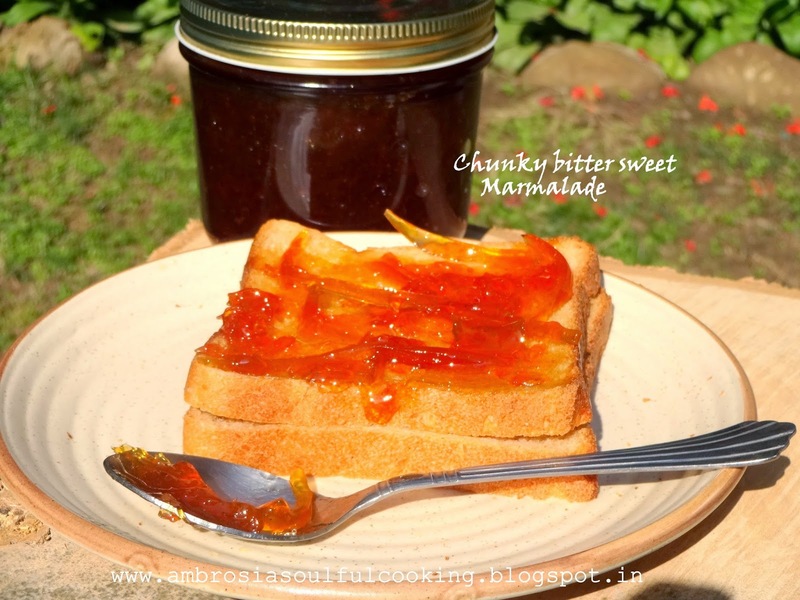 Bitter sweet chunky marmalade lashed on butter drenched warm toast is pure heaven! While I was taking pictures, a bee came and sat on the bottle. It felt like a compliment! Wash the pomelos and lemons thoroughly with hot water. Peel the rind of one pomelo and one lemon with a sharp peeler. Take care not to get the pith (white portion underneath the rind). Cut peels into thin strips. You may peel the other pomelo and cut peels into thin strips if you want a chunkier marmalade. Cut the pomelos into quartets. Remove the flesh (juicy hair) collect in a bowl. 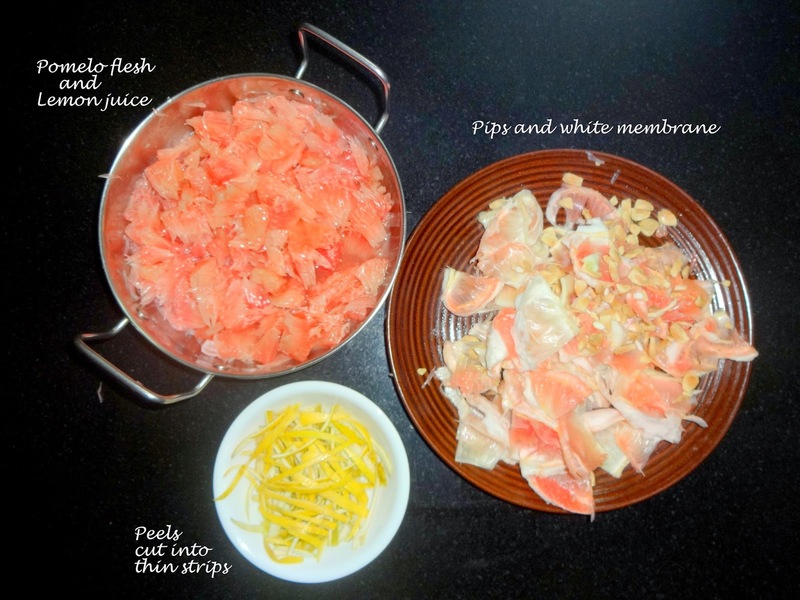 Collect the pips and the white membranes of Pomelo. Cut lemons into half. Juice the lemons and add the juice to Pomelo flesh. Collect pips and white membranes of lemon. Take juice and flesh in a steel wok. Add peels and add enough water to cover the fruit completely. Make sure that the quantity of water is on the higher side and not less. Take all the pips and white membrane in a muslin cloth. Tie a knot tightly. Add this muslin bag to the steel wok. Cook in medium flame. Stir the mixture and keep pressing the bag. Pips and membranes are rich in pectin. Try to extract as much as possible. It will give marmalade a jelly like consistency. Turn off the heat when the peels turn mush. Press the muslin bag for pectin. Discard. Measure the juice–peel mixture in cups. 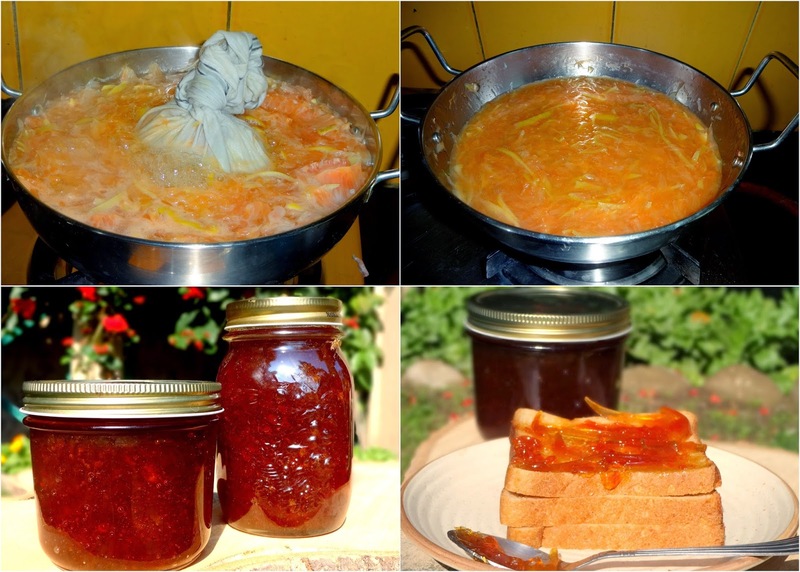 Add equivalent quantity of sugar or more if you want a sweeter marmalade. Freeze a small steel plate. Cook on medium heat. Bring it to rolling boil, then cook on low heat. Keep stirring. Cook till mixture becomes thick. Drop some marmalade onto the plate and push back with the index finger. If it wrinkles and collects, it is done. If it spreads thinly, it needs to be cooked more. While the marmalade cools, sterilize the bottles. To sterilize the bottles, Place the washed and dried bottles with the lids in the oven. Set the temperature to 100 degrees and set the timer to 10 minutes. Remove the bottles and their lids from the oven. Ladle warm Marmalade into hot sterilized jars, leaving ½ inch space.